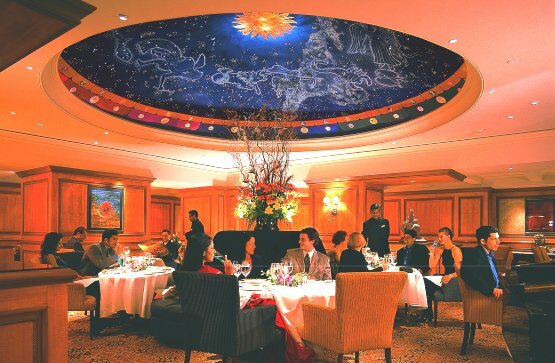 The Zodiac Grill, at the Taj Mahal Palace, creates an unforgettable ambience that perfectly complements its creative menu and attentive service - from the designer tableware from the House of Bernardaud, to the lilting tunes of a pianist, and the magical ambience cast by a star-spangled dome to the glowing candlelit tables. With such beautiful atmosphere, the Zodiac Grill makes the perfect place to celebrate any occasion or to just enjoy a memorable meal. Inspired by the beauty of heavenly bodies and the belief in zodiac signs, The Zodiac Grill presents a special menu each month for its associated zodiac sign. The restaurant also serves gourmet set lunches and a selection of the finest single malts, Cognacs, Armagnacs, international spirits, liquers and wines. Signature dishes include New French Goose liver, Kahlua Mousse, Camembert Dariole and selections of caviar from the House of Caviar. Fine dining with a twist, the Zodiac grill is a chic eatery that offers a thoroughly eclectic array of quasi-cultural fusion cuisine is on offer.